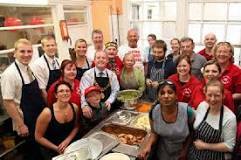 Penny Dinners is a city-centre based charity that has been serving hot meals and snacks to the poor since the 1840′s. Since the recession struck more than five years ago, the number seeking help at their city-centre premises on Little Hanover Street has increased year-on-year. So making sure everyone gets fed is no mean feat. ‘‘Many just come in one or two days a week when the money has run out,’’ she says. Cork Penny Dinners is a non-stop operation. The charity opens seven days a week, 365 days a year, thanks to a dedicated army of 180 volunteers who give generously of their free time. Their day grinds into action at 6am when the first of the workers arrive to begin food preparation and they open their doors to the public at 9am. Their premises are basic, consisting of a kitchen, dining room and outside toilet. There is no central heating. Caitriona describes an average day at Cork Penny Dinners. Patrons also get sandwiches and snacks to take with them so they have something to eat in the evening. But despite the generosity of the public, Caitriona says that they need more. The charity is currently seeking food donations, both non-perishable and perishable items, in the run-up to Christmas. If you would like to donate a packet of Veronica’s Snacks to Penny Dinners, simply like and Share the post on Veronica’s Snacks Facebook page where the Gluten Free Snack company have pledged to match every like and Share with a bag of delicious Veronica’s Crisps. hi there, I represent cork cultural centre, Shandon street, cork, and I was wondering if there is a way to help, we have been thinking of arranging a soup day or food day for homeless and needy people but we heard that there are regulations to that, so we are wondering if we could work with you in doing this. please let me know if it is possible to cooperate.